The Europeans are a sort of Jonathan Winters wandering the global barnyard: they offer comic relief, but have something tragically disturbing about them. 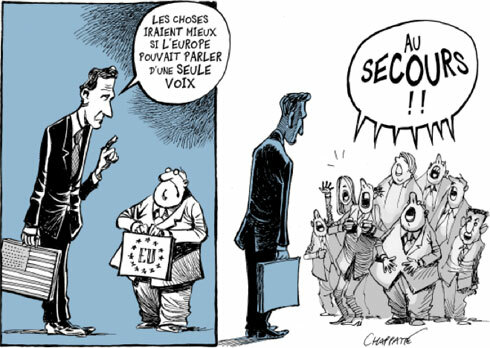 In this case, the underlying assumptions behind this cartoon by Patrick Chapatte: the hapless, innocent Euro-elves, victims of circumstance and anything else that they had no hand in, being talked down to by a towering white American man vaguely reminiscent of the elder George Bush. Ordered around in their innocent, childlike state, they are of course, victims of bullying or something. ... "Things will get better if Europe learns to speak with one voice."